The Page 99 Test: Margaret Litvin's "Hamlet’s Arab Journey"
Margaret Litvin is assistant professor of Arabic and comparative literature at Boston University. An acquaintance hefted Hamlet’s Arab Journey in her hand and said: “Wow, almost 300 pages – who knew the Arabs even had theatre, let alone Shakespeare?” By that standard, the most significant fact about page 99 of my book is 89 more pages follow, plus endnotes, bibliography, and index (“evil, 84. See also: Claudius”). For some of my intended readers, the mere fact of a sustained and intelligent century-long Arab engagement with Shakespeare will be news. (There does not even exist a standard monograph on contemporary Arab theatre.) For others, the news will be how the Arab Hamlet tradition has refigured the familiar character, turning the post-1800 West’s posterboy for self-questioning interiority into a visionary activist, a fighter for justice brutally martyred by an oppressive regime. The dramatic character being analyzed on page 99 [below left; click to enlarge] of my book is halfway between these two archetypes. He is the would-be political assassin Sulayman al-Halabi, as imagined in mid-1960s Egypt by playwright Alfred Farag. 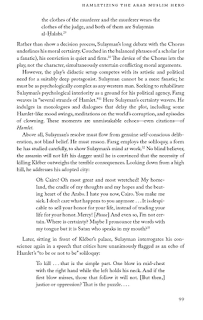 Unlike most of the other Hamlet-based characters I describe, Farag’s Sulayman hesitates. 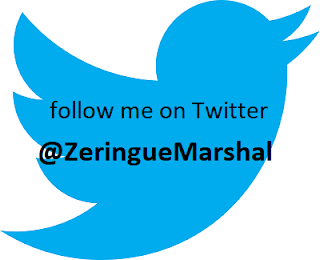 Weighing the obvious rightness of his act (killing General Jean Baptiste Kleber, the head of Napoleon’s occupation army in Egypt) against the savage collective punishment that will surely follow, he asks, “Justice or oppression? That is the puzzle.” In a series of monologues that Egyptian critics immediately identified as “Hamlet-like,” Sulayman exhibits introspection and even doubt. 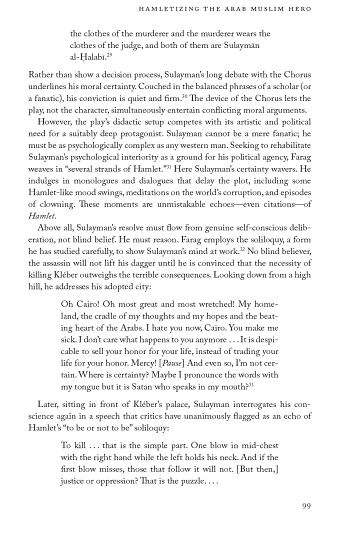 In this section I argue that Farag’s obvious Hamlet citations are strategic, serving to telegraph to the audience that Sulayman has the psychological depth required of a “serious” and “world-class” protagonist. Ironically, Hamlet functions here at a pretty superficial level, cited as a label or even emblem of character depth. In the postcolonial uncertainty of the 1950s and 1960s, Egyptian theatre had a lot to prove. Later Arab Hamlets would leave such hesitation behind. With the resounding Arab military defeat in the June War of 1967, Arab writers understood that political agency was granted to the strong, not the psychologically deep. The question of “to be or not to be” was to be solved by seizing a place in history, collectively choosing “to be.” Meanwhile the death of Egyptian president Gamal Abdel Nasser (1918-1970) let writers cast him as Hamlet’s father: a charismatic ghost whose vision was both a moral duty and a practical dead end. Thus the post-1970 Hamlet characters I analyze are would-be revolutionaries, either heroic Che Guevara types or (later, when that hope has dimmed) bumbling, pathetic failures. The feeling spreads across much of the region, not just Egypt. One late-70s satirical adaptation from Syria is called Hamlet Wakes Up Late; a mid-1990s Iraqi play is called Forget Hamlet. “The time is out of joint,” these bitter plays argue, but the one “born to set it right” has overslept. My perspective on Arab culture deliberately focuses on intellectuals and their cultural lives. To some critics’ dismay, I eschew the explanatory lenses (Islam, international politics, street-level ethnography of very poor people) common to many other Middle East books for general readers. By using Hamlet as a sort of bridge or key, I hope I can help my American readers go deeper into the feelings of their closest Arab peers and counterparts: people who are idealistic, curious about others, in some cases rather well-read. But those intellectuals are not some kind of disconnected elite. Rather, their speeches, essays, poems, and plays have articulated (and helped shape) real political aspirations widely shared throughout their societies. The popular drive “to be,” to purge what is “rotten in the state,” has helped make Arab history at several moments in the twentieth century and again in the past year and a half. It seems “Justice or oppression” is still the puzzle. Learn more about Hamlet's Arab Journey at the Princeton University Press website and the Hamlet's Arab Journey Facebook page.